Nakamura and Caruana discussing their draw in round five. | Photo: Lennart Ootes/Saint Louis Chess Club. On Sunday, the number of leaders went from four to five at the 2019 U.S. championship. Sam Sevian defeated Varuzhan Akobian to join the group on plus one. Jennifer Yu dropped her first half-point but still leads the women's tournament. The big clash between Hikaru Nakamura and Fabiano Caruana finished early. Again deploying the Sveshnikov ("We did so much during the match on it, I figured why not use it!" said Caruana), the world championship challenger was quickly out of book but found some good moves on his own to hold the balance without too much trouble. "The thing is I was winning so many games with the Petroff and I am not winning any games with the Sveshnikov so you tell me which opening is sharper!" joked Caruana. Nakamura discussing some variations with Caruana after the game. | Photo: Lennart Ootes/Saint Louis Chess Club. The day before, on Twitter, Magnus Carlsen had teased Caruana for not winning for 26 games in a row. Caruana didn't reply online (his last tweet is from late January, when he responded to Kramnik's retirement) but wittily responded to Maurice Ashley: "I'll take any record I can get!" Another top grandmaster, who is rather omnipresent on Twitter, did react. "I enjoy [when] Magnus and Anish go at it, that's pretty entertaining!" said Caruana. | Photo: Lennart Ootes/Saint Louis Chess Club. Sam Sevian is now also one of the leaders, after an excellent, attacking win with the black pieces vs Var Akobian. The latter regretted not taking on e5 in the opening, after which Black's play was relatively easy. Sevian decided to unleash an attack that was kind of hanging in the air anyway. Akobian's time trouble didn't help him finding the difficult defense, despite the fact that 29.f5 is kind of a reflex move that he could have played in a blitz game. Sam Sevian, now one of the five leaders. | Photo: Lennart Ootes/Saint Louis Chess Club. Timur Gareyev, who didn't continue playing in the Mid-American Open after missing the third round there (and probably realizing that playing two tournaments simultaneously is too crazy even for a blindfold simul specialist! ), won his first game in the tournament. Gareev vs Liang. 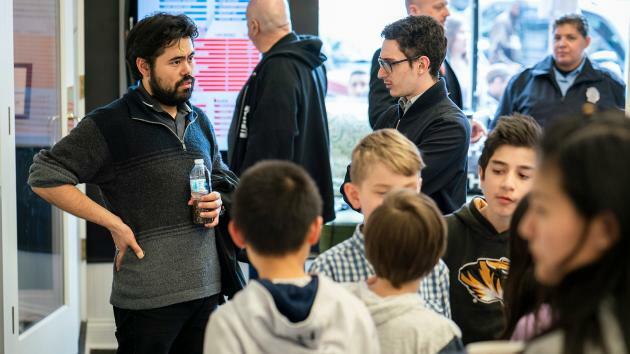 | Photo: Crystal Fuller/Saint Louis Chess Club. FM Carissa Yip has been providing quite a bit of entertainment so far, playing a tournament without draws. Her rather easy win against FM Maggie Feng got her back to plus one. Carissa Yip and Maggie Feng start their game. | Photo: Lennart Ootes/Saint Louis Chess Club. WGM Tatev Abrahamyan is now in third place after winning three games in a row. On Sunday she beat WIM Ashritha Eswaran from the black side of a French defense. It was the positional line with ...Qd7 and it worked out perfectly for Black when a beautiful knight on c4 was dominating a bishop on c1. Tatev Abrahamyan won three games in a row. | Photo: Lennart Ootes/Saint Louis Chess Club. The official broadcast of round five.